NGC 5253 is one of the nearest of the known blue compact dwarf galaxies. It is located 11 million light-years away the constellation Centaurus. The galaxy is considered part of the Centaurus A/Messier 83 group of galaxies, which includes the famous radio galaxy Centaurus A and the spiral galaxy Messier 83. 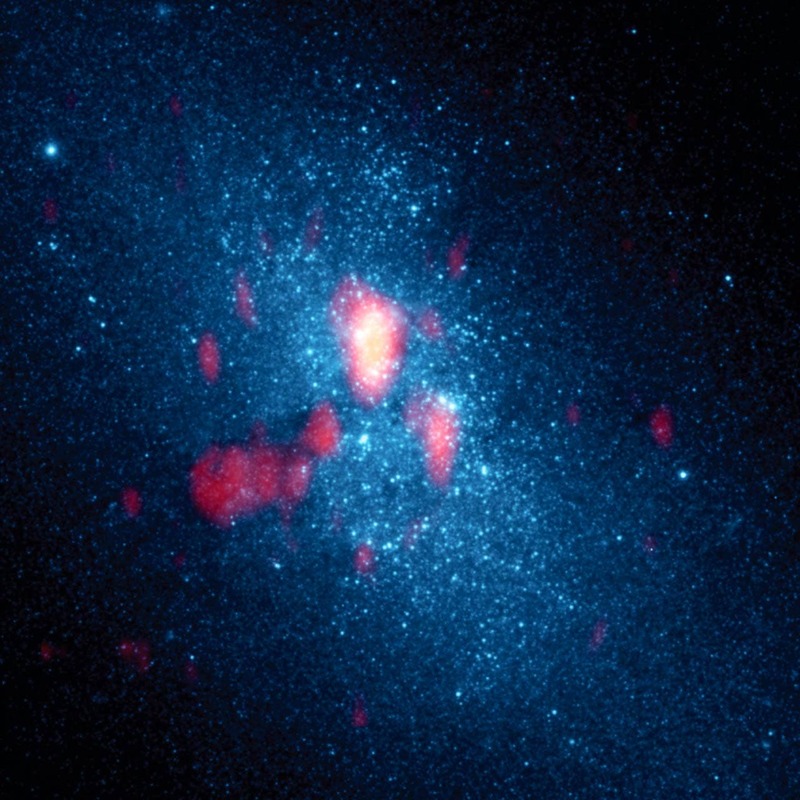 Previous studies have suggested the possibility that its peculiar nature could result from a close encounter with its closer neighbor, Messier 83. The newly-discovered star cluster is buried within a supernebula in NGC 5253, and contains more than 7,000 massive O-type stars – the most luminous of all known stars – and has one billion times the luminosity of our Sun, but is invisible in ordinary light, hidden by its own hot gases. NGC 5253 has approximately nine times as much dark matter as visible matter — a much higher rate than the inner parts of the Milky Way. In coming years, the cloud could be destroyed by stars that become supernovae, which would spin all of the gas and elements created by the stars into interstellar space. Our Milky Way Galaxy has not formed gigantic star clusters for billions of years. It is still forming new stars, but not in nearly such large numbers. Some astronomers had believed that such giant star clusters could form only in the early Universe. Prof. Beck said her team is continuing to study and monitor the galaxy using the Atacama Large Millimeter/submillimeter Arrray in Chile.